Geek life, family style. 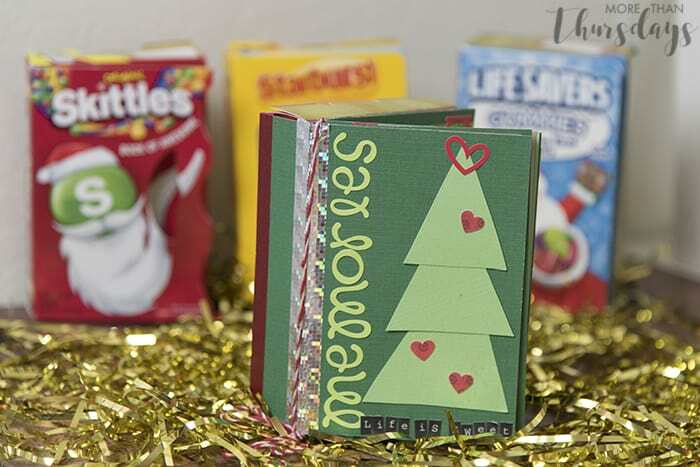 Crafts, recipes, and assorted shenanigans. This shop has been compensated by Collective Bias, Inc. and its advertiser, MARS Incorporated. 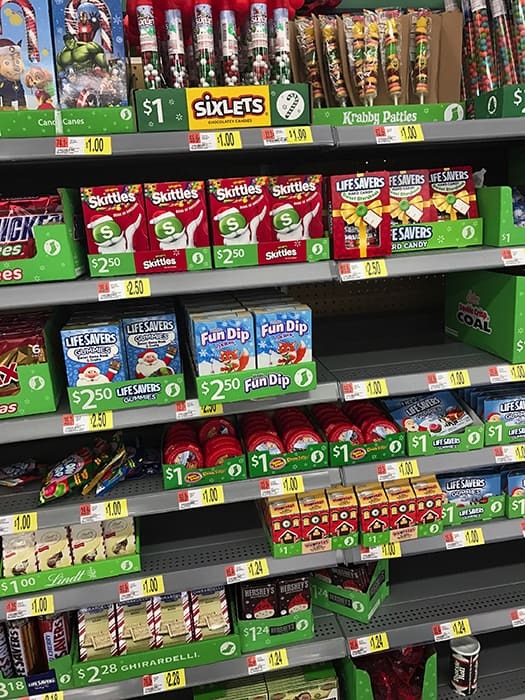 Who doesn’t love candy for the holidays, right? 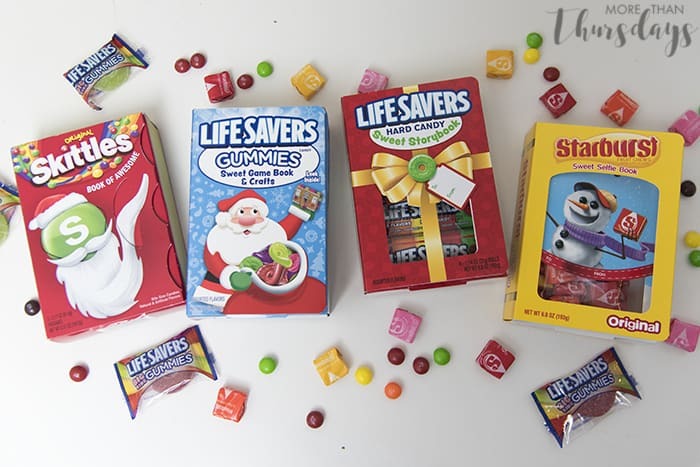 These cute storybooks from Wrigley are a gift and sweets in one; you can pick from the Skittles® Book of Awesome, Starburst® Sweet Selfie Book, Life Savers® Sweet Storybook or Life Savers Gummies® Sweet Game Book and Crafts. They’re all available at a Walmart near you, so you’re sure to be able to find the perfect one for someone you love. 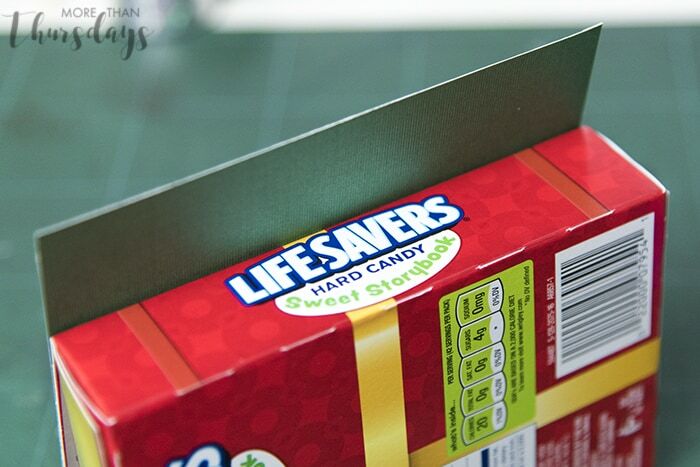 The Skittles® Santa Beard is adorable, but I couldn’t wait to add my own touch to the classic Life Savers® Sweet Storybook. 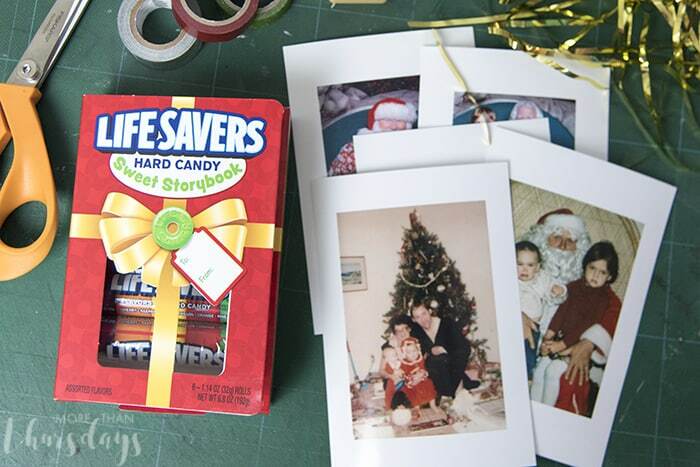 Using a little collection of some of our family’s holiday photos and a few craft supplies, I added pages to the Life Savers® Sweet Storybook so that it’s not just a box of candy, but it showcases some beloved memories as well. 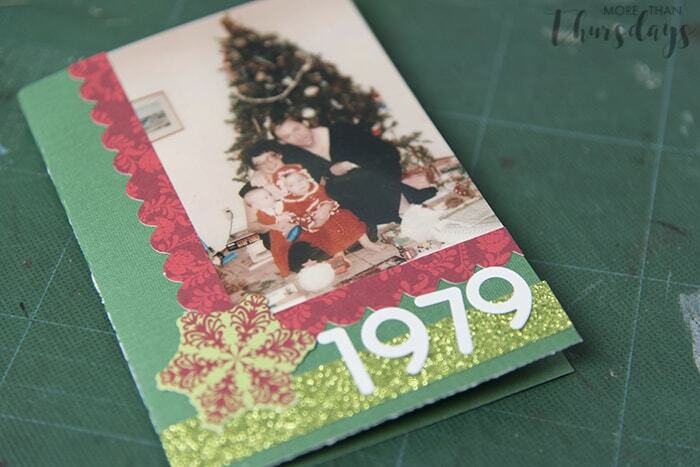 I just used a variety of supplies I had on hand, but bare minimum will be some cardstock in holiday colors, reprints of your scanned photos, a paper trimmer and some good adhesive to hold everything together. First, cover the outside of the book. I cut this piece to 5 7/8″ x 5″ so that I could cover the spine with one continuous piece from the cover. 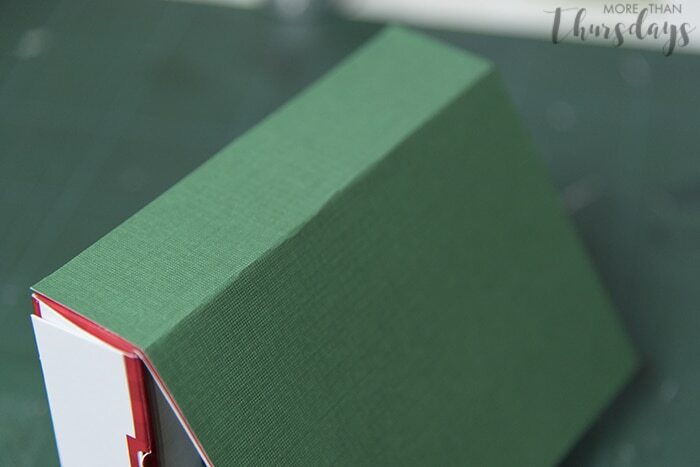 Be sure to adhere it well and score the corner well so it folds easily. For this project, I only covered the front and spine of the book, because I wanted to leave the info on the back of the box exposed, but you could easily cover the whole thing if you prefer. 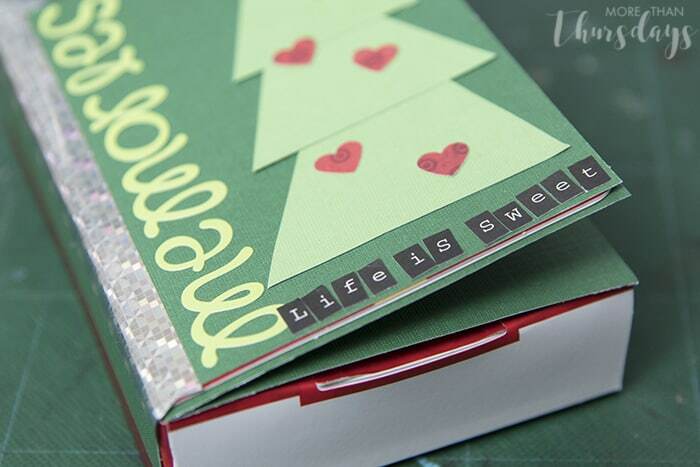 Decorate the cover however you like; I did a simple graphic tree and a couple of “Memories” and “Life is Sweet” titles using letter stickers and cardstock. 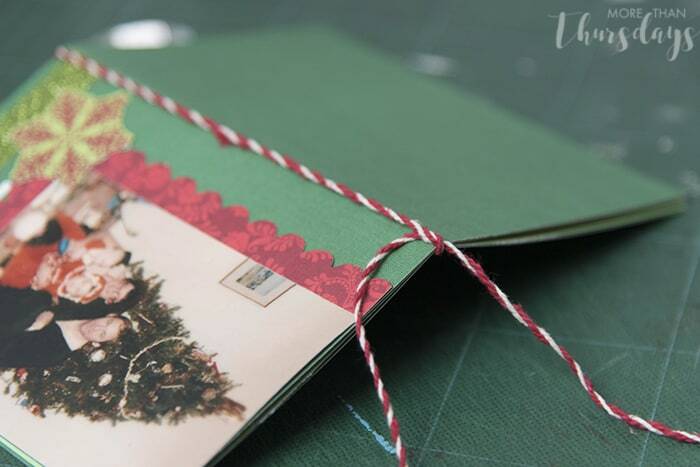 Cover the inside of the covers as well; use two separate pieces to cover each panel rather than using a single folded piece, so the cover will close flatter. 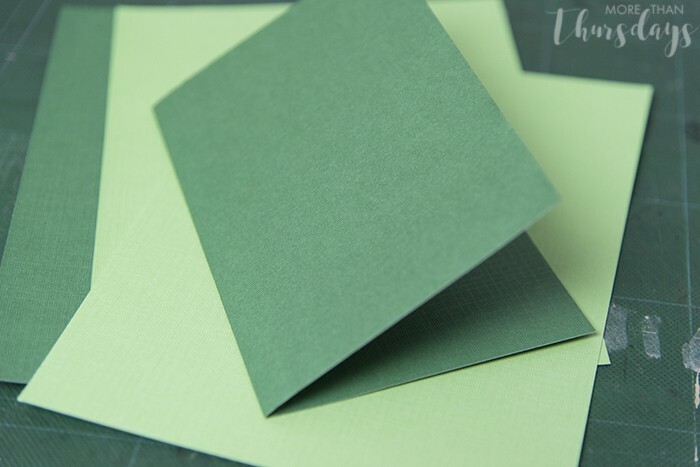 Next, we’ll start building the inside pages; it’s up to you how many you need, but don’t forget that each piece will be folded in half, so you get 4 “pages” per sheet you cut. Now’s the fun part! 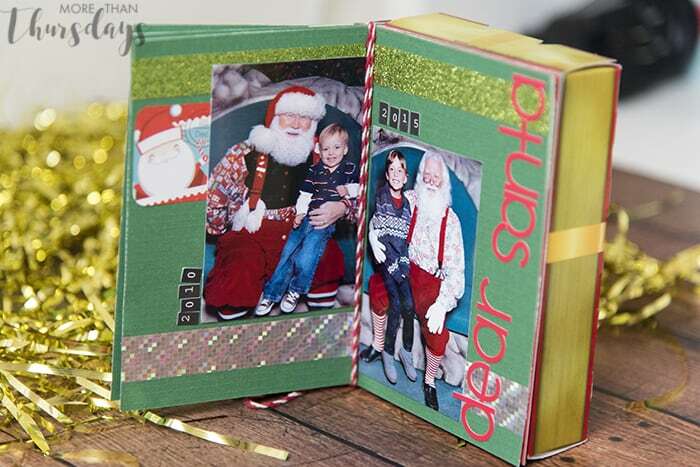 It’s up to you how you decorate each page with your photos. I used a combination of old (my childhood) and more recent (Max) photos to get a little collection going, but this would also work great with prints from a single photo session. 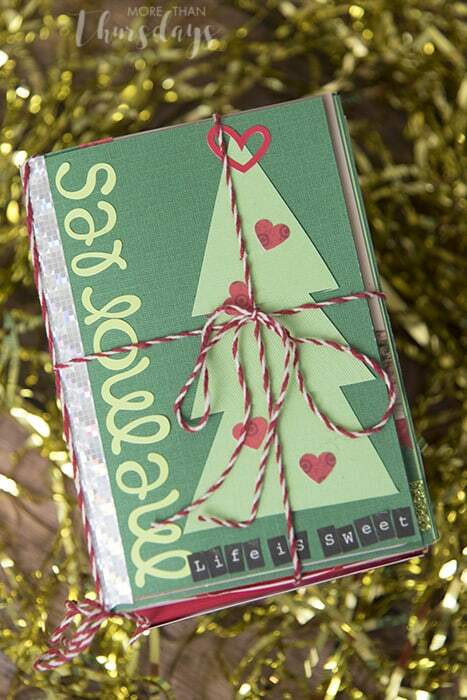 Once you have all of your pages decorated, it’s time to assemble the book! 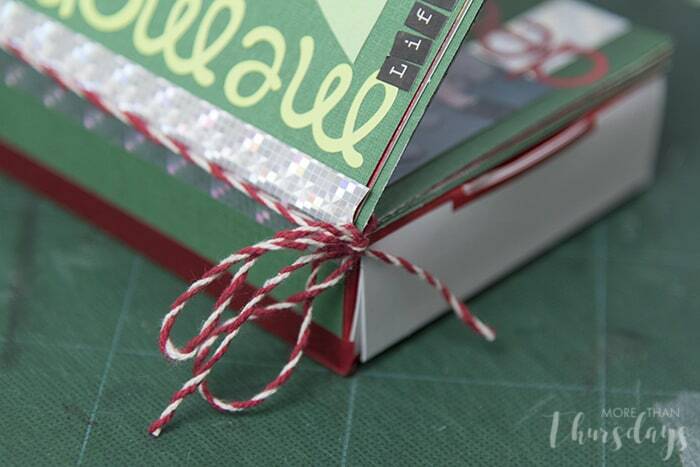 Using decorative twine, cut a piece that’s about 4 times longer than the book is tall. 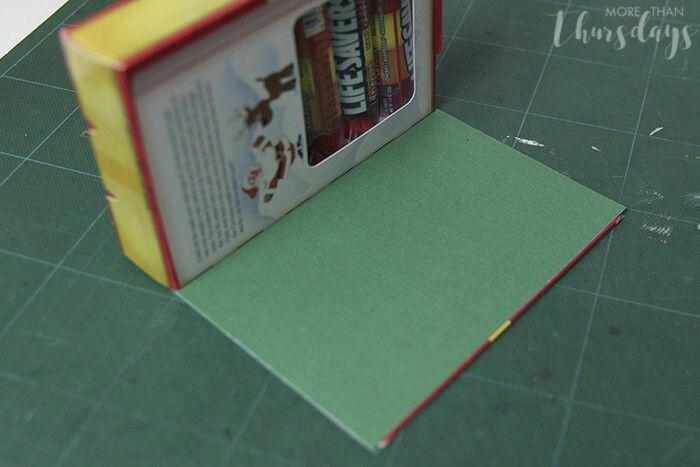 Loop it around the top of the book pages and tie at the bottom to create the spine to hold your added pages in place in the box cover. You can take advantage of the centerfold spread and create a single layout for both pages; I’ve got two of Max’s past Santa pictures here. I recommend wrapping the whole thing up with some more twine, or a pretty ribbon, to help hold it closed so your recipient has the joy of unwrapping it as well. 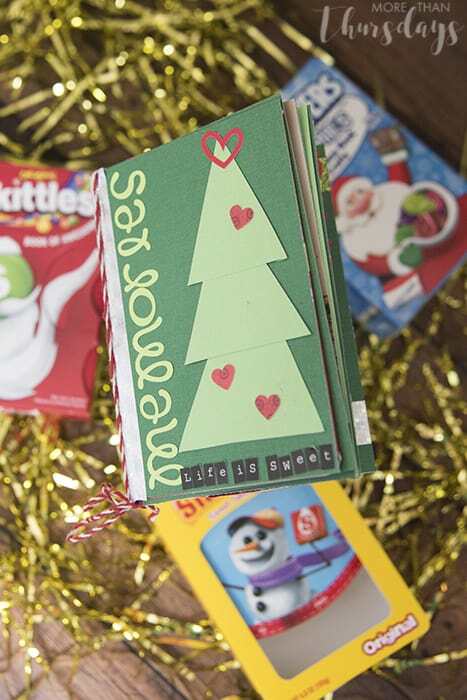 Find more creative Sweet Storybook ideas here! 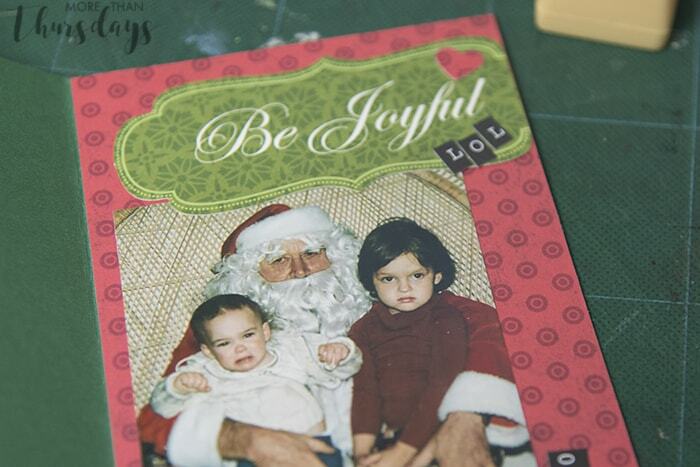 “Be Joyful” cracked me up! Love it. Welcome, I'm so glad you're here! Thing number one, I'm tall. I've been told I should have a warning on my blog, so here it is! I am taller in real life than I appear on the internet. Want to know more than this "short" version? 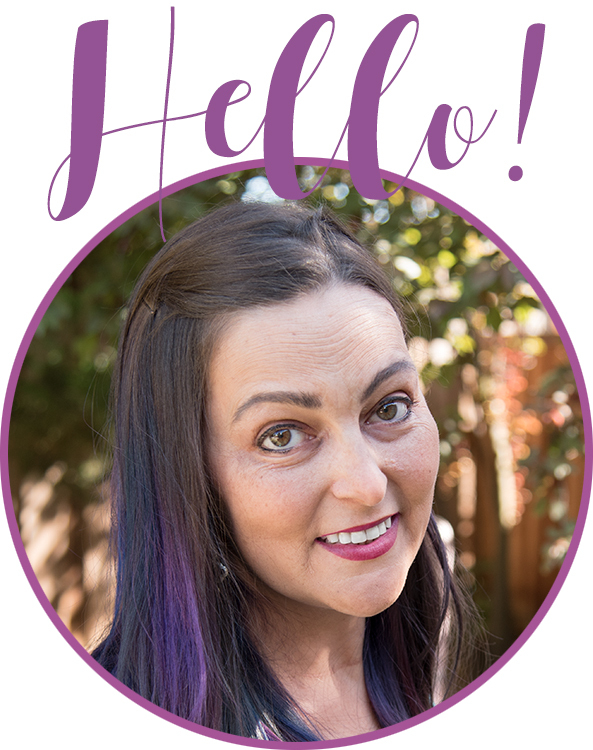 Go here to read more about me and my family, and for links to some of my favorite posts. More than Thursdays is a participant in the Amazon Services LLC Associates Program, an affiliate advertising program designed to provide a means for sites to earn advertising fees by advertising and linking to amazon.com. Get a free geeky crafts eBook when you sign up!